"The greatest game-changer since penicillin"-- Crikey readers debate both sides of My Health Record. Last week, readers were particularly divided on the risk and reward of the government’s My Health Record rollout, the security of which Bernard Keane questioned. The debate was heated and well worth a read. Meanwhile, Charlie Lewis’ question of white nationalist, ex-felon and parliamentary hopeful Jim Saleam’s eligibility to stand was met with support for Saleam’s democratic rights, reminding us of that old Australian adage, “I do not agree with your neo-Nazi history, but I will defend with my life your right to have it”. Guru writes: The My Health Record, if properly taken up and used, has the potential to be the single biggest game-changer in health since penicillin. No, I am not overstating it. It holds the potential to massively improve outcomes, accelerate research, reduce costs which can be reinvested in health, enable value-based healthcare (value being determined by paying for outcomes that are important to patients), reduce medication errors and inappropriate polypharmacy, save time and save lives in emergencies, identify what implants patients have when there are product recalls and the list goes on. Yes, there is some privacy risk — the same as there is with your banking, your car registration data, your Facebook data, your medical records currently in your doctor’s surgery, your medicare and Centrelink data. But the payoff is much higher than for all of these and is well worth the risk. 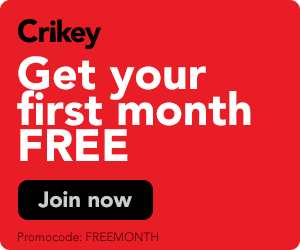 Desmond Graham writes: About time Crikey addressed the issue, but left it too late — opt-out only lasts from July 16 to October, so it’s a once in a lifetime restricted opportunity. The process has also been so designed that the opt-out process is so difficult that most people will give up halfway through and those without computers are restricted. Oliver B writes: I really don’t much care about the unlikely event that someone learns I get migraines. I do care that paranoia about health record storage will prevent me getting proper emergency care, and will prevent researchers seeing patterns that might help me prevent the migraines. Paddy writes: I’ve seen some mad stuff with government departments before, but for sheer Kafkaesque nonsense, how about this one from the My Health Record cancellation page: “Once your record is cancelled, it will be retained for a period of 30 years after your death or, if the date of death is unknown, for a period of 130 years after the date of your birth. Your My Health Record may be accessed by us for the purposes of maintenance, audit and other purposes required or authorised by law.” Words fail me. Rais writes: Unlike the US where they seem to think a felon should become a voteless second-class citizen for life even after they have paid their debt to society, Australian citizens are not disenfranchised, although they have to be citizens only of Australia to sit in Parliament. The candidate in question should have his background publicised, then the voters can decide whether he should represent them. TheRabidHamster writes: He stands, and if enough fellow racists contrarians want him, he wins. If not he scuttles back to whichever rock he normally lives under. Leon Knight writes: The main question would seem to be why didn’t Pauline accept him as a PHON candidate — he seems well-qualified. The Attorney General's Department can't keep your info safe, taxing props, the faltering Free Tommy movement. The Commonwealth Bank would have been forced to disclose its mammoth data breach if the government had fulfilled its promise of requiring companies to report breaches. But instead the government took three years to do it. Good morning, early birds. Opposition Leader Bill Shorten demands compensation for victims of the banks. Plus, the shocking rate of data breaches against Australians' health records. It's the news you need to know, with Chris Woods. Emails exclusively obtained by Crikey via FOI have revealed that the Department of Social Services initially decided to hide last year's data breach from affected employees. Erstwhile prime minister and globetrotting guest lecturer Tony Abbott has extolled the benefits of climate change at a gathering of "climate sceptics". Plus, the government has admitted a national security contractor was hacked last year. It's the news you need to know, with Max Chalmers. On the health records issue I am sceptical as to their use. My wife, admitted to hospital in Gladstone in the ER was diagnosed off the cuff by an attending medico, even though her critical medical history detailing alerts that should have raised flags was ignored. When I pointed this out to the medico I received a ranting abuse for my efforts. He did grudgingly read said record. If this is the way they are handled, at the “coal face”, what is the point of having them? Something insurance companies can troll through?